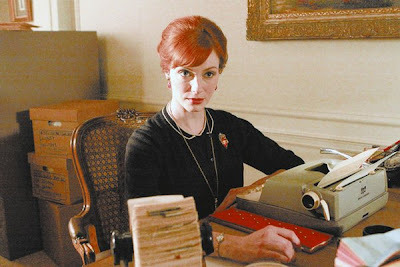 If you have yet to discover AMC's Mad Men, it's not too late. Mad Men is a television show set in the early 1960s at a New York City advertising agency on Madison Avenue. The show brilliantly explores the sensibilities of a bygone era in our not too distant past. The characters are vivid, the writing exquisite, the music, the sets, the costumes, all come together to remind us how much the world has changed in five decades and how much it hasn't. Some describe Mad Men as a soap opera, and if you're going to watch it you will want to start at the beginning. I think of it more as the best, and perhaps longest, feature film I've ever seen. The quality of the show is that good. Season three finished this fall. The first two seasons are available on DVD and all three seasons are available from iTunes. Below is an image of the actress Christina Hendricks who plays Joan Holloway Harris, and is one of my favorite characters on the show.